Disclaimer: I received Sabre Runner Pepper Gel with Adjustable Hand Strap to review as part of being a BibRave Pro. Learn more about becoming a BibRave Pro (ambassador), and check out BibRave.com to review find and write race reviews. Protecting myself by being smart and while carrying Sabre. I play the scenario out in my head. Being attacked while running. Would I fight back? Yes. Would I scream? Hope so. Would I run away? I'll try if my fighting back isn't working. 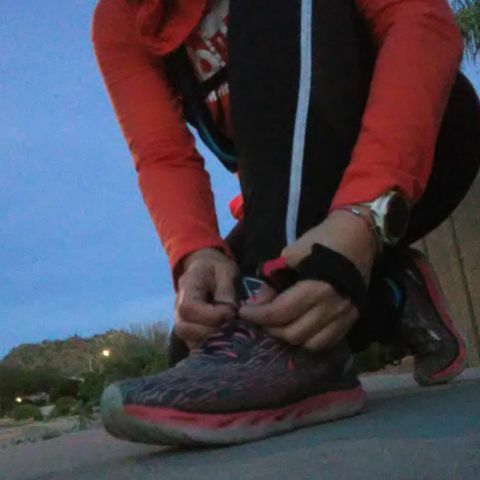 This is a reality that all outdoor runners — male or female — have to deal with. Society has been talking about it more because more people, women in particular, have been attacked or killed while doing something they are passionate about, running. I am careful while I am running and do particular things that I will elaborate more on but I didn't run with protection. It was a surprise to me that BibRave was offering a unique testing opportunity. An opportunity that I couldn't pass up. 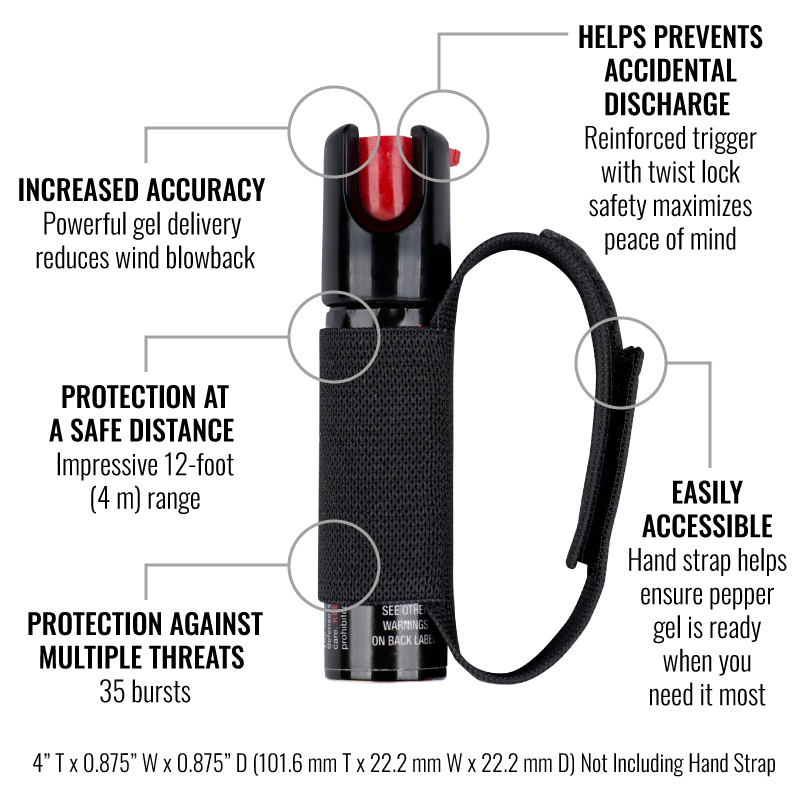 Test pepper spray by Sabre. The interesting thing is, this isn't ordinary pepper spray, it's actually a pepper gel and Sabre is the most trusted brand by police. Here are ways that I keep safe while running and how I now incorporate Sabre in my running routine. I'll only run in the dark in areas I know, like my own neighborhood. I'm constantly looking and seeing and listening. Yes, I look behind my shoulder a lot. I'm not paranoid, I'm being observant. If you are running somewhere new, think about what could be there before you hit that run. Will there be commuters, animals (domesticated or not), train tracks, alley ways, no street lights, etc. If we are aware about surroundings, then it's less likely we will be caught off guard by a sudden surprise. My running clothes are bright or have reflective elements ironed on them (hello, Brilliant Reflective!) You'll also find blinky lights on my head and hydro vest. I'll put one red blinky light on the back and side that faces the street on my hydro vest. I look everyone in the eye and wave. That could be others walking or running and even people in their cars driving. Tired morning commuters see me better when I acknowledge them. I always remember that a person driving is NOT looking for people on bicycles, runners or walkers. They are looking for other cars, so acknowledging them goes a long way. A coyote will always be greeted with a stomp of my feet, loud clapping hands and a yell of "GO!" They run off when I do that. I even greeted two dogs off their leash that way! Thankfully they ran off. I don't ever want it to come to this, but I will protect myself any way possible against harm. Lately, I've been running with the Sabre Runner Pepper Gel with Adjustable Hand Strap. It's a gel, so there isn't blowback like from a spray. It has UV dye aids. I never thought about a pepper spray or gel having this technology. The UV marking dye aids in suspect identification. It's the #1 brand trusted by police and consumers worldwide which included county sheriff & U.S. marshals from New York, Chicago PD and Los Angeles. The spray range is huge at 12 feet and Sabra mentions that is 20% greater range than other products. I get that running with extra running gear is cumbersome. During my multiple runs with the Sabre Runner Pepper Gel, I didn't notice it on my hand. It also stayed on my hand securely because of the adjustable velcro hand strap. So I took it to my food scale and discovered It weighs only 1.4 ounces, even with the velcro hand strap and holder! It can also be used-multiple times, there is enough protection in the bottle for 35 bursts. This surprised me because I assumed that a pepper spray or gel is a one time use only. 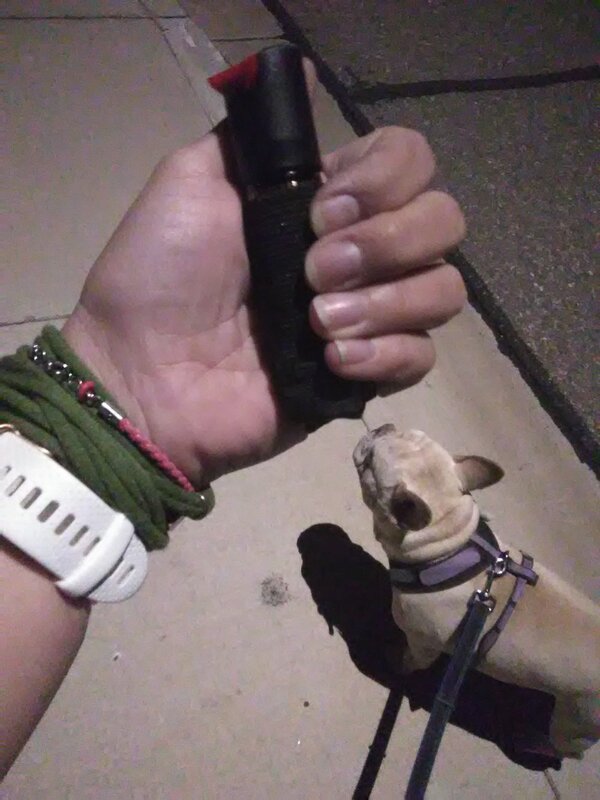 Walking your dog while carrying the Sabre Runner Pepper Gel is easy. For the most part, I run alone and that's a good reason to carry the Runner Pepper Gel. But I also frequently walk my dog, Wally. He's 30 pounds, so not totally a small dog but he could appear to be an easy target for a coyote or bobcat. I have both species living in the desert preserve behind my home. Sabre doesn't recommend spraying the Runner Pepper Gel at dogs, they make a specific dog spray for that, a product that won't permanently hurt the dog, just disable their attack in a humane way. If a coyote or other non-domesticated animals comes between me and Wally, I will spray it with the Runner Pepper Gel. I noticed that the Runner Pepper Gel is perfect for when you are walking a dog. The velcro strap makes it simple to keep the pepper gel on your hand while picking up doggy doo-doo. All I did was flip the strap and case around to the top of my hand, then proceeded to clean up. Once I was done, I just flipped it back. No need to put anything in my pocket. My protection was always there. Since protection is always near, Sabre built in a reinforced trigger with a twist lock. It can be turned on and off with the flip of your thumb. I'm right-handed and I found the pepper gel was easy to engage and disengage the twist lock with either my left or right hand. I had no idea that something so small could make me feel so confident. Each mornings run now includes me running with the Sabre Runner Pepper Gel. My brain is already in an euphoric state during most of my runs so it feels good that I could let my mind wander just a bit because I know I'm carrying strong protection. If you are interested in the Sabre Runner Pepper Gel, it can be purchased from their website or from their Amazon store. Do you want to feel it on your hand before you buy? I’ll be at the Scottsdale Half Marathon & 5k this Sunday, December 9th pacing the 2:50 half marathon group. I’m bringing the Sabre Runner Pepper Gel to show one of my Instagram runner friends. You are welcome to come check it out! Find me holding my pacer sign or comment here!